Hibs triumphed in the first Edinburgh derby of the season with a blistering first half display against city rivals Hearts as record-breaking signing Ulises de la Cruz netted a double. The Ecuadorian defender went some way towards paying back the record £700,000 transfer fee manager Alex McLeish splashed out on him with his first goals for the Leith men. Heavy rain fell throughout the opening 45 minutes and Hibs’ passing and movement was as slick as the slippery playing surface with Grant Brebner and John O’Neill pulling the midfield strings. Hearts manager Craig Levein handed new loan signing Ricardo Fuller his first start in place of the injured Andy Kirk and Stevie Fulton was replaced by Stephen Simmons. Hibs, backed by a vociferous home support, got off to a dream start when they took the lead after only 36 seconds. From the right-hand side Alen Orman slipped the ball to De la Cruz at the edge of the Hearts box and he swivelled and curled a tremendous left-foot shot high into the net. Franck Sauzee had a free kick from the edge of the box deflected past for a corner and then Ulrik Laursen caused trouble with a cross from the left which eventually was put past by O’Neil. In the 18th minute De la Cruz could have scored in a counter-attack involving Craig Brewster and O’Neil but stumbled before shooting and the ball hit the side netting via the legs of Hearts goalkeeper Antti Niemi. However. De La Cruz grabbed his second in the 23rd minute. The ever dangerous Paco Luna raced on to a clever Brebner pass, turned Alan Maybury on the byline and his cut back was deflected straight onto the toe of the Ecuadorian who tapped the ball in from a yard out. Hearts created one good chance when Fuller was sent clear down the left, but the Jamaican’s poor angled drive from inside the box shot across the six-yard box and away. 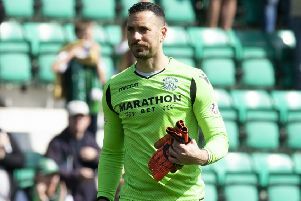 Hibs replaced Brewster, who had picked up a booking and was making a number of reckless challenges, with Tam McManus five minutes before half-time and the substitute shot powerfully from 14 yards but just outside Antti Niemi’s left post. McManus passed up a great opportunity on the hour when he failed to make contact with a cut back from De la Cruz just yards from goal after the Hearts defence had made a gift of the ball. Ian Murray got on the end of the cross but his shot flew high over the bar. Four minutes later, Hearts were thrown an unlikely lifeline when Simmons steered home a deflected cross from Juanjo. The goal gave Hearts renewed hope and took some of the wind out of Hibs’ sails as the game grew increasingly scrappy. Hibs: Colgan, Fenwick, Sauzee, Laursen, Orman, De La Cruz, Brebner, O’Neil, Murray, Brewster, Luna. Hearts: Niemi, Maybury, Pressley, Wesbter, Mahe, Juanjo, Severin, Simmons, Flogel, Adam, Fuller.